You can use this tab to send est emails of your campaign. Select the option to send an individual Test or to send to a Group of contacts. 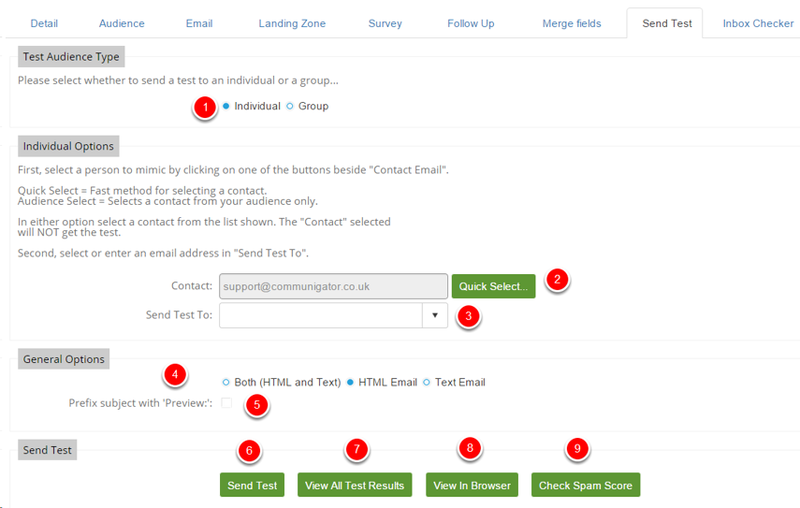 This is the contact that is being mimicked within the test Email, so any personalisation within the Email will be as if this contact had received the Email. This is the Email address that test will be sent to. Select whether to send both the HTML & Text version or just HTML or Text. Tick this is you wish to prefix the subject line with Preview, this is handy so you can identify that it is a test Email. Click to send the Test. Click here to view all test results for the campaign. Click here to view the Email in your browser. Click here to check the Spam score of the Email.